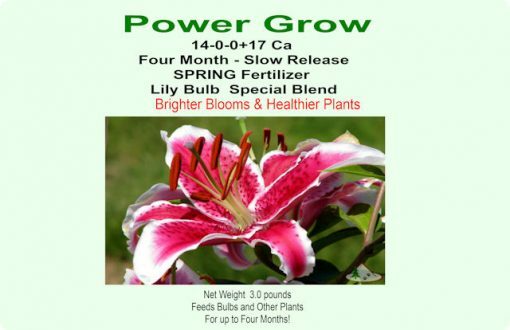 Spring Lily Bulb Food, Bulb Food Fertilizer. Specifically formulated for lily all bulbs. Likewise, all bulbs. Works on all indoor an outdoor plants, too. Healthier more colorful blooms.EXCLUSIVE! . We have tested our patent pending new formulas and wow! The new mixes are even better than before! Our four month slow release Spring lily bulb food is rich in Calcium. Just what lily bulbs need. Others, too. And other trace elements that will build healthier plants. Therefore, larger and more colorful blooms. Can be used on many other indoor or outdoor plants, too! For best results: Apply in the Spring as a top dress. As bulbs start to emerge and grow. Or when planting new bulbs or plants.